"Did these people all drink a quart of Robitussin before the shooting?" Run Time: Approx. 400 min. Mystery Science Theater 3000 is a cult unto itself, with a devoted fan following to rival any in genre entertainment. Credit is due to Comedy Central, which picked up the show, about a man stranded in space with three robots forced to watch (and mercilessly mock) some of the worst films ever made, from a public access station in Minnesota. MST3K, as it came to be called, quickly gained a cult following, thanks to the fledging cable network's decision to show it over and over and over, usually in the middle of the night. "Our advantage was, we were long," jokes Kevin Murphy in the interview included on this set. In the early days, Comedy Central didn't have a lot of programming, so a two-hour time-filler was a very valuable commodity. Not too much credit, though, because after seven years on the air, Comedy Central canceled MST3K for no good reason. Thanks to a groundswell of support from dedicated internet fan clubs (the groups purchased ads in Variety in a time before the cancellation of every third-rate WB failure resulted in a deluded fan campaign), the Sci-Fi Channel picked it up, retooled it slightly, and put it back on the air. The network seemed a perfect match�Sci-Fi asked that all the ridiculed movies be genre pieces, but MST3K has always been at its best when shredding cruddy alien invasion flicks�and the show had survived rough patches in the past, including the departure of creator and original stranded spaceman Joel Hodgson, who left the series during Season 5. Head writer Mike Nelson stepped in to fill the vacancy with his doughy Midwestern charms. Another original cast member left in the interim between the Comedy Central and Sci-Fi years; Trace Beaulieu, who played both the mad scientist Dr. Forrester and the voice of Crow T. Robot, moved on to other projects. Beaulieu's exit left the show without its primary villain and its reason for being. After all, if the mad scientist wasn't there to force Mike to watch the movies, then what was the point? The Sci-Fi Channel had some solutions, and that's where the problems come in. The network wanted the show's "host segments" (intermittent periods where Mike and the 'bots take a break from the movie to perform a skit) to have a story arc. The writers resurrected a character played by staff writer Mary Jo Pehl: Dr. Forrester's mother, Pearl. Pearl spent her time chasing the Satellite of Love around the galaxy, and every few weeks the whole gang would visit a weird planet that spoofed some sci-fi clich� (like the planet where apes evolved from men, or the planet where it's like earth in Roman times). The skits are sometimes funny, but I never warmed to Pearl and her sidekicks Bobo the Monkey (Murphy) and Brain Guy (comedian Bill Corbett, who also filled in ably as the new voice of Crow). Luckily, if nothing else, the movie segments improved during the Sci-Fi years. For the most part, the movies were better (meaning still bad, but not so bad that even wisecracking robots couldn't make them entertaining�it was a problem during the Comedy Central years, which included such cinema excrement as Manos: The Hands of Fate). (And yes, that does mean "Hands: The Hands of Fate.") The frequency of mocking comments increased, but kept a balance of pop culture jabs, obscure references, and plain non sequiturs. Which brings us to the DVD releases. Because of complicated licensing deals required to put an episode out on video or DVD, season sets were never an option. And up until the end of 2003, Rhino Home Video concentrated only on releasing the Comedy Central episodes it had already licensed for VHS releases. Some fans felt less than enthusiastic about seeing the same batch of 20 or so episodes for sale when the series has savaged nearly 200 bad movies. But last December saw the release of a four-episode boxed set of shows from the Sci-Fi era. It was a bit of a mixed bag, with only one real standout (the fan favorite Space Mutiny). This new set (Volume Five; there were also eight Comedy Central episodes released on individual DVDs) is a marked improvement. Three of the episodes are among the best of the series' later years, and the fourth is better than average. My favorite of the bunch is Time Chasers, a wretched student film about a skinny nerd with a mullet (Tom: "Movie, this cannot be our hero.") who invents a time machine using a prop plane and his Apple IIe. (Did you know the secret of time travel can be stored on a single 5-1/4" floppy?) An interesting aside, the creators of the film actually offered it up to the MST3K crew, and reportedly took offense to the way it was treated. Really, what were they expecting? Merlin's Shop of Mystical Wonders is another great one. Ernest Borgnine "stars" as a creepy old guy who tells his young whiny grandson very disturbing stories about evil toy monkeys with the power to kill. Pieced together from two unrelated episodes of a failed TV show, Merlin really has nothing to do with Merlin, but I guess the brand name counts for something. The Touch of Satan is another winner, a disturbing tale of a soul-sucking granny who has experienced the touch... of Stan! Oh wait, that's a typo. Hey, who's Stan? Finally, there's Boggy Creek II: And the Legend Continues. This creature feature is a little tedious, and the commentary doesn't seem to be up to snuff (it's a 10th season episode; in the series' final year, Sci-Fi asked the writers to space out their comments a little more). I'd love to have every episode of MST3K on DVD, but I doubt I'll live long enough to see it happen. While I wait, I'm perfectly happy with these intermittent releases from Rhino. Image Transfer Review: MST3K is all about making fun of bad movies, and bad movies and bad prints tend to go together. So if the images the trio are watching and mocking look a little rough, it's not distracting, it's appropriate. The host segments look suitably crisp and colorful. Fine detail isn't great, and the images are a little soft�the source material looks to be video�but it's a nice presentation overall. The episodes look much better than they did on cable, and there is none of the intermittent digital artifacting that plagued early series releases. Audio Transfer Review: Audio quality is, like the video, rather mixed. The host segments sound very good. The mix is pretty basic, with only a few instances of stereo separation. The film segments aren't as good, owing, again, to the source materials. The jokey commentary is clear, but the bad movies' tracks can suffer from excessive hiss, shrill music and muffled dialogue. Still, it's not like I expected Rhino to clear up these tracks; they're part of the show as originally presented. Extras Review: With the release of MST3K: Volume 5, Rhino finally began adding some worthwhile extras to satisfy rabid fans (unless you count the option to watch the film without the humorous commentary�the option was included for a few of the nearly 30 episodes available on DVD, but in no case could I ever consider the option to watch one of these films without the soothing sarcasm of Mike and Joel and the 'bots a bonus). Once again, each episode is preceded by a short intro from Mike Nelson. His comments are brief, but usually amusing. I'd love if he could get together with a few cast members for an actual commentary; I don't know if they'd actually have anything to talk about specific to a particular episode, but it would be entertaining. The big news this time, though, is a newly recorded 27-minute interview with Nelson and Kevin Murphy (the voice of Servo and the man behind the Bobo mask), included on the Boggy Creek II disc. The two are chatty, and their dry wit is on full display as they talk a bit about the history of the series and what they've been doing since it ended. Long-time fans have probably heard most of this material before (much of it was included in the Amazing Colossal Episode Guide), but there are a few tidbits even for die-hard MSTies. You learn, for instance, that the story arc that ran through the host segments during the Sci-Fi era was implemented at the behest of the studio brass; the writers apparently never felt comfortable with it. You also get to find out which episodes the two count among their favorites (sadly, neither matched mine, so I might have to wait a while longer before Riding with Death sees the light of day on DVD). The original trailer for The Touch of Satan is an odd inclusion. It takes the old "beat the audience into submission by repeating the film's name 33 times in two minutes" marketing method to new heights. Each episode includes a healthy 20 chapter stops, but sadly, no subtitles or captions. I realize it must be difficult to transcribe the film's audio and the MST track at the same time, but it worked well enough on the VHS and DVD releases of MST3K: The Movie. Previous sets have included some kind of moveable packaging element (the cover of Volume 3, for example, opened up � la the series' signiture doorway sequence). I can't say I mind much not having that; the fancy detailing always seemed fragile and more often than not, made the box sit funny on the shelf. 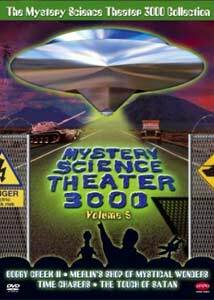 Some Myster Science Theater 3000 fans never took to the show during the Sci-Fi era, but for my money, they're among the best episodes in the series' 10-year history. This boxset, in terms of extras and episode quality, is also probably the best Rhino has released.